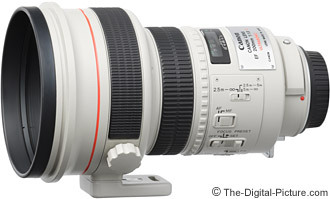 Note: The Canon EF 200mm f/1.8 L USM Lens has been replaced by the Canon EF 200mm f/2L IS USM Lens. I don't often evaluate discontinued gear, but the Canon EF 200mm f/1.8 L USM Lens had been tempting me for a long time. Your requests for a review were all I needed as an excuse to try out this legendary lens. The biggest problem in reviewing this lens is finding one to buy - along with scraping up the cash to pay for it of course. There were not a huge number of these made and most people who have them will not sell them. My 200 f/1.8 L was sourced from "chamcamera" in South Korea through EBay. Lee at chamcamera proved reliable and seems to at this time have a deep source for these discontinued lenses. My mint, high serial number, $4,600 200 f/1.8 L arrived safely - and quickly after a short stop in customs. My understanding is that this lens originally cost about $4,500 but was selling for as little as $3,400 before it was discontinued in 2003 (more about this later). Supply and demand pricing was tilted toward demand in this case. Demand is high because this is the widest 200mm Canon AF lens ever made. With it's f/1.8 aperture combined with a relatively long focal length, this lens can capture shots that no other Canon lens can achieve. And for this reason, it is sure to bring a smile to your face - and to that of your family, friends and clients. Above from left to right are the Canon EF 24-70mm f/2.8L USM Lens, Canon EF 200mm f/2.8L USM Lens, Canon EF 200mm f/1.8 L USM Lens and Canon EF 300mm f/2.8L IS USM Lens. 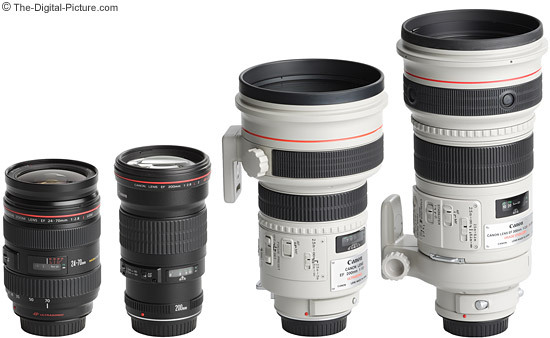 The same lenses (sans the 24-70 L) are shown below with their included lens hoods in place. Though handholdable, the weight of the Canon EF 200mm f/1.8 L USM Lens becomes uncomfortable after a relatively short period of time. The shape and front-weighted balance of the lens are somewhat uncomfortable for handholding as well. Much more comfortable is using the 200mm f/1.8 on a monopod. However, the tripod ring is a bit too far forward for ideal balance and control. Because the tripod ring is positioned near the front of the lens, the lens hood covers it when reversed. Obviously, the lens must be removed from a tripod/monopod for this to happen. This design does not even allow clearance for a quick release lens plate to remain attached to the tripod ring. On the positive side, the tripod ring is really smooth and has click-stops at 45 degree positions. Also smooth is the MF ring which leads us into the next topic - focusing. The 200 f/1.8 utilizes a relatively fast rotary helicoid-type focusing mechanism driven by a quiet Ultrasonic Motor (USM). I found my in-focus AI Servo hit rate to be good, but not as good as the newer super telephoto lenses such as the Canon EF 300mm or 400mm f/2.8L IS USM Lenses. One shot AF has proven very accurate. A shallow DOF (Depth of Field) at f/1.8 makes getting perfect focus at shorter distances especially challenging to both the camera and the photographer. This ultra-shallow DOF is one of this lens' most desirable optical characteristics. The shallow DOF, combined with excellent bokeh (quality of foreground and background blur) and a 200mm focal length allow this lens to create a beautifully smooth background blur. It is very nice. To decrease focus acquisition time, a focus distance limiter switch is provided. Select between 2.5m and 5m, 5m and infinity or the full range - 2.5m to infinity. Obviously, 2.5m (8.2') is this lens' MFD (Minimum Focus Distance) - a rather long distance for this focal length. MM (Maximum Magnification) is therefore low. Manual focus is a focus-by-wire design - a motor drives the lens focusing as the well-damped focus ring is turned. This design requires the camera to be powered on to drive the motor. Although FTM (Full Time Manual) focusing is available, you first need to press the shutter release half-way (or AF-On button) and achieve AF lock. Then FTM focusing will work as long as you keep the shutter release pressed half way. An especially nice feature is the adjustable manual focus speed. A switch allows selection of three focus speeds: 1 = 1/2 standard (for precision), 2 = standard and 3 = 2x standard (for fast-moving subjects). Like most of the super telephoto lenses, the 200 f/1.8 L has a preset feature. To use this, achieve the desired focus distance and slide the Focus Preset slider switch toward the camera. A "beep" indicator will be heard if the signal selector is turned on (another small switch). The preset focus can be later recalled by turning the knurled reading ring in either direction (before the shutter release is pressed half way - which locks focus) and holding it while the picture is taken. I can think of a few useful situations for using a preset focus distance, but in reality, I personally do not use it very often. The 200 f/1.8 L is a partially weather sealed lens. A lens mount gasket is not present, but the switches and focusing ring have moderate dust and moisture resistance. A front filter should be used for sealing purposes. Overall, build quality is as you would expect from an L lens this expensive - excellent. The same holds with image quality. The Canon EF 200mm f/1.8 L USM Lens is sharp wide open and extremely sharp stopped down to f/2.8. Corner performance is excellent. The ISO 12233 Resolution Chart sample crops for this lens were carefully shot twice (using AF, MF and lots of bracketing each time). The first test results were repeated in the second test. I shot the test twice because I expected this lens to be sharper wide open in the center. My actual-use confirms these results - My 300 f/2.8 IS and 400 f/2.8 IS lenses are sharper in the center wide open. Others have reported both the same results and the opposite results. So what I am left with is an uneasiness about sample variation in this lens. I can tell you that I bought the nicest quality 200 f/1.8 I could find. 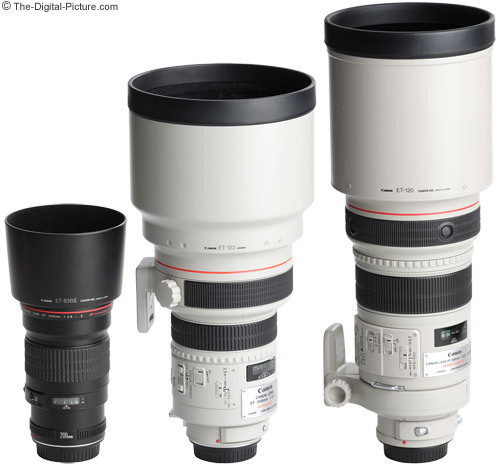 Of course, the 300mm and 400mm f/2.8 IS lenses are 1 1/3 stops slower wide open. If you are not shooting sharp black and white edges, your results will appear much better than the ISO 12233 chart. Again, corner performance is very good even wide open. Distortion from the 200 f/1.8 L is negligible and CA is very well controlled. Color and contrast are very good. Vignetting is noticeable, especially in full frame corners at f/1.8. The shading pattern leaves the center especially bright relative to the rest of the image (see the vignetting contour link a the top of this page). Vignetting is mostly gone by f/2.8. Stopped down exposures with this lens tend to meter 1/3 stop brighter than with the Canon EF 200mm f/2.8L USM Lens. 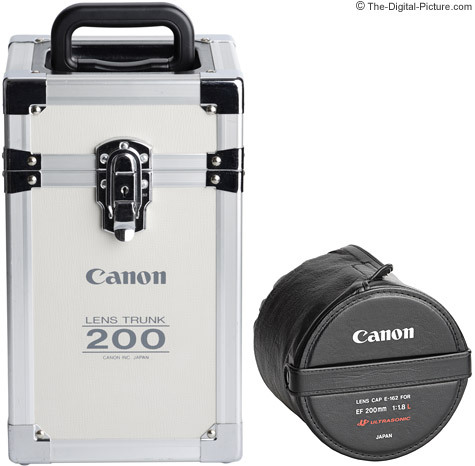 The 200 f/1.8 L was originally shipped in a very-protective Canon Lens Trunk 200 as shown above. The trunk measures 8.5" x 8.75" x 14" (216mm x 222mm x 356mm). A neck strap and the leather-like Canon E-162 Lens Cap/hood cover (above right) are also included. This style of lens cap is not as easy to get on/off as a normal pinch lens cap, but does offer more protection. It is not easily bumped off and protects the sides of the hood as well. A drop-in 48mm Gel Filter Holder II is included. This style of filter is logical for a lens with such a large objective element as a screw-in front-mount filter would be very large, very expensive and hard to handle. Extender compatibility increase the versatility of the 200 f/1.8 L. Adding the Canon 1.4x Extender creates a 280mm f/2.5 focal length and max aperture while the Canon 2.0x Extender creates a 400mm f/3.5. Narrowing the aperture by one stop produced decent results for me - aside from the increased CA and distortion. The other fixed focal length 200mm EF lens available (as I write this at least) is the also excellent Canon EF 200mm f/2.8L USM Lens. This lens is much smaller, much lighter and much less expensive. Being an L lens, the 200mm f/2.8 delivers excellent image quality and has excellent build quality along with USM AF. Wide open, it is sharper than my f/1.8 at f/1.8. At f/2.8 through a few stops narrower, the f/1.8 is very slightly sharper. The f/1.8 has stronger and less even vignetting wide open, but has less vignetting at f/2.8. The f/2.8 has very slightly less vignetting at f/4 and f/5.6 but both are looking good at this point. The f/1.8 has less CA than the f/2.8 at f/2.8 (which itself is good). Stopped down they are similar. The f/1.8 delivers better out-of-focus image quality - a smoother, more attractive foreground and background blur. In the above comparison, a distant mountain background is shown at f/5.6 - the 200 f/1.8 result is on the left and the 200mm f/2.8 is on the right. Both lenses were focused on the same foreground object but the 200 f/1.8 renders a more smoothly blurred background. While the optical differences between these lenses are not large enough for most of us to be concerned with, what the 200mm f/2.8 does not have is an f/1.8 aperture. Those buying the Canon EF 200mm f/1.8 L USM Lens are seriously interested in the special-ness of this wide aperture. They are generally after the best low-light action images possible - or the most diffused background blur possible at this focal length. With its long reach and relatively huge aperture opening, it is perfectly suited for dance performances, stage events and any other night or indoor sports including gymnastics, ice hockey, wrestling, basketball, football ... Pull this lens out, and you will likely be the envy of those competing for shots at your event. Portrait photographers are another group that appreciates this lens. The 200mm focal length allows nicely compressed faces with a completely blurred background. Add some distance from you to your subject for 3/4 and full body portraits and still get a highly blurred, non-distracting background. The Canon EF 200mm f/1.8 L USM Lens was introduced in 1988 - before Canon initiated their environmentally-conscious lead-free policy. At issue was the lead in the waste from the grinding process - not that remaining in the glass. For this reason, the 200 f/1.8 was discontinued. And to the disappointment of many of us, a new version of the 200 was not immediately introduced. Simply put, Canon was not at that time able to manufacture the specific optical glass necessary to create a replacement lens in a lead-free process. Technology advances ... Ironically, while I was reviewing this lens, Canon introduced the Canon EF 200mm f/2L IS USM Lens - one of the top lenses on my most-wanted list. Though 1/3 stop slower than the 200mm f/1.8, this new lens includes Canon's latest technology including image stabilization. IS will not be helpful for sports (unless you are panning with a subject), but should be very helpful for lots of other uses including stage events and portraits. This beauty should be available in 2008. My guess is in the first quarter or half of the year as a working prototype was on display at the Photo Plus Expo in October 2007. The announcement of the new lens painfully cost me about $1,100 (plus shipping and selling costs) on the resale of my 200mm f/1.8. I don't know if the market price will change direction before we get the new lens, but it has definitely reduced demand for the older lens - making it a greater value. Note that Canon no longer repairs this lens.